This page is designed to provide useful information for those ordering goods from our site, or for those looking to return any purchased goods to us. 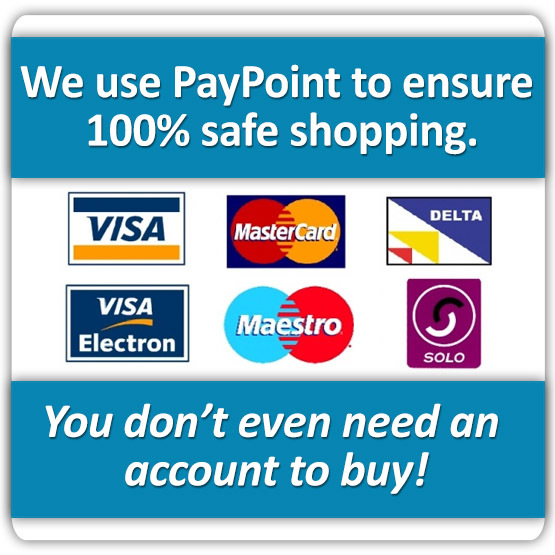 This accompanies our Terms & Conditions which can be found by clicking here. Please read this page carefully before placing your order and making plans for receiving your delivery. If you have any questions, please contact us on 01942 885700 during normal business hours - we will be happy to help with your enquiry. When placing your order with us via this website, you can specify two dates that are convenient for you to receive your goods. We will do our best to deliver to you on your chosen dates but cannot guarantee this will happen. If circumstances do not allow the delivery to occur on your chosen dates, we will contact you to arrange an alternative date. Please note that deliveries on Saturdays, Sundays or Bank Holidays will cost extra - we would advise you of these extra costs before dispatching your order. Please allow at least one weekday before your chosen delivery date to allow us to organise and dispatch your order. We would strongly suggest that your chosen delivery dates be before your date of installation. While we will endeavor to arrange delivery of your goods on a date that is convenient to you, we cannot predict or control what time your goods will arrive. This is because of various factors including traffic, multiple deliveries, etc. The majority of deliveries will happen between 8:00am and 5:00pm on the agreed date, although the goods may arrive outside of this time frame in a minority of cases. It is very important that you ensure that somebody is at the delivery address all day in order to receive the goods. Baths sold via this website are delivered directly by the Supplier, who will no longer accept returns on damaged baths once they are signed for by the customer. Please ensure that you do not sign for the goods until you have thoroughly inspected any baths for damage, as the Supplier will not issue replacement baths after this point. If the bath is damaged or faulty in any way, please inform the delivery driver, who will take the faulty item away. We will then arrange for a replacement to be delivered to you at your earliest convenience. Your goods will be delivered to you directly by the Supplier - we do not deliver the goods ourselves. This may mean your goods arrive via more than one delivery, in the case of your goods being delivered by more than one supplier. All deliveries are classed as Kerb-side Delivery Only - this means that the goods will be delivered to your address, but the loading of goods in to that address will be your responsibility. Upon receiving your goods, it is very important that you inspect them to ensure the goods you have received are correct as per your order, and are not damaged or marked. If you do notice any damage, or if the goods received are not what you ordered, please inform the driver before he leaves. We will then make the necessary arrangements with the Supplier for re-delivery on a weekday that is convenient to you. Failure to properly check your goods upon receipt may result in delays in rectifying any issues, and in some cases may even result in you being liable for any re-delivery charges. Should you have any questions or concerns regarding your delivery, please contact us and we will be happy to assist - we will liaise with the Supplier to resolve any issues you may have. Some of our customers specify that their goods be left in a secure location of their choosing, rather than receiving the goods themselves. While we do agree to do this, please be aware that in doing so VIP cannot be held responsible for any damage or theft that may occur after delivery, or any costs incurred in moving the goods after they have been delivered. As the goods cannot be inspected upon delivery in these circumstances, there may be a re-delivery charge should any problems be found with your order. Although the vast majority of our deliveries go smoothly as planned and without incident, there are a very small minority of situations in which problems may occur (for example due to extreme traffic, severe weather conditions, vehicle malfunction, etc) resulting in the agreed delivery date not being met. In these situations we would contact you as soon as possible to arrange a new delivery date that is convenient to you. As stated above however, the agreed date is a guideline rather than a guarantee, and as such VIP cannot be held liable for any costs incurred by you as a result of the agreed delivery date being missed. In the event of there being nobody at your specified address to receive the delivery, or should the delivery information provided be incorrect, we will endeavor to arrange re-delivery on a suitable date. However in some cases a re-delivery charge may be applicable. We do not provide Invoices with our deliveries as standard, but will be more than happy to provide these via email upon request - please contact us at any time if you would like an Invoice for your order. The above are general guidelines about our Deliveries. Please note that upon purchasing you will be bound by our Terms & Conditions, which can be viewed at any time via this link. In the unlikely event of damaged or unsatisfactory goods, our team will be happy to assist you and to help rectify the situation. Please ensure that any returns requests are generated within 7 days of delivery. 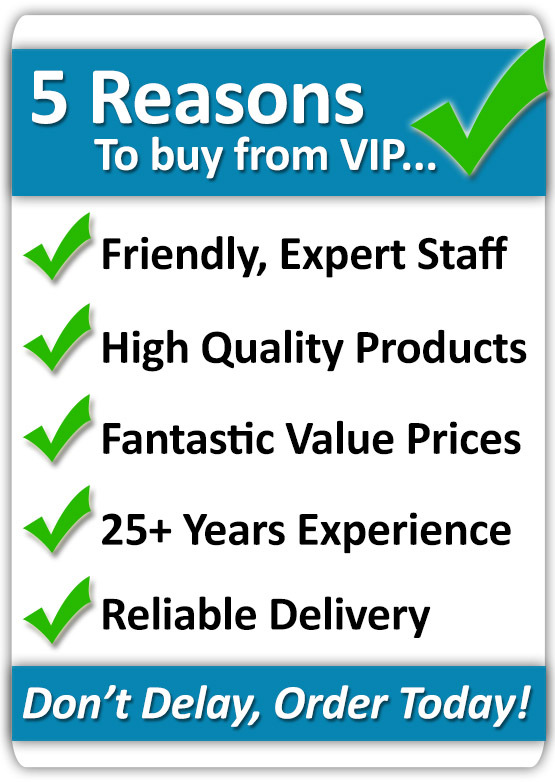 You can contact us on 01942 885700 or email us at returns@vip-bathrooms.com. If you change your mind or find that the goods you ordered are surplus to requirements, we will accept returns of these goods so long as they are still in perfect, re-sellable condition, and in their original packaging. In these cases we would arrange collection of the goods from you on a mutually convenient date. Upon arrival your returned goods would be inspected and if in a suitable condition, a refund for the goods would be provided. Please bear in mind however that certain collection or re-stocking charges may be applicable depending on circumstance - we will advise you of any such charges before arranging collection of the goods. All goods sent to our customers go through vigorous quality testing and regular inspection to ensure they are in superb condition upon dispatch. Goods are packaged in such a way as to minimize the chance damage or scuffing. Although the vast majority of goods arrive in excellent condition, there are a small minority of rare cases where goods are accidentally damaged in transit. If upon inspection you find this is the case, please contact us via the methods described above. We may require you to photograph the damage and email it to us in order to process your request - failure to do so may result in your Return being delayed or rejected. We will then liaise with the Supplier to arrange a mutually acceptable date upon which the damaged goods will be collected and replaced with new ones. There is no additional charge for this service. Before reporting any damage, please bear in mind that most of our items - especially baths, basins, toilets and other ceramic items, come encased in a thin layer of protective plastic. Please ensure this is removed before reporting any faults. While we will do our very best to resolve any situations that may arise, there are certain scenarios under which we regret that Returns and / or Refunds will not be provided. We cannot offer collection, return or refund of any goods which have been used or installed. Please ensure that all goods provided are acceptable before use / installation. We are also not liable for any damage incurred to products, possessions or household as a result of incorrect installation or usage of the products provided. We cannot offer collection, return or refund of any goods which have incurred damage after delivery. All of our products are sourced from only the most reputable and high-quality Suppliers and Manufacturers. As such the vast majority of our goods are covered by Guarantees (the terms and length of which differ based on a product-by-product basis). In the highly unlikely event of problems due to errors in manufacture, we will endeavor to collect any faulty items and replace them with brand new ones, as per the process outlined above. Unless stated otherwise, all items sold on this website come with a 12 month Guarantee against manufacturing faults or defects. Many products however offer substantially longer Guarantee periods as a testament to the manufacturer's faith in product quality. VIP cannot be held liable for any damage done to products, possessions or household as a result of any manufacturing defect or fault - in these cases, please contact the Manufacturer directly. The above are general guidelines about our Returns or Refunds. Please note that upon purchasing you will be bound by our Terms & Conditions, which can be viewed at any time via this link. Should you have any questions or comments, please don't hesitate to contact us - we will be happy to answer any questions you may have.